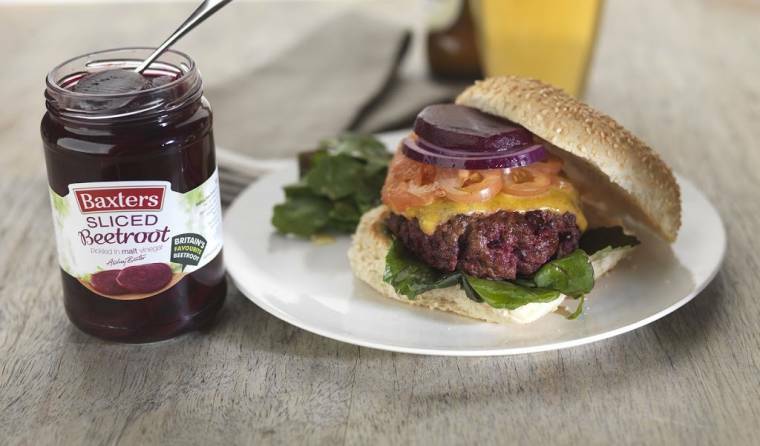 Baxters Baby Beetroot is added to lean minced beef burgers which are then topped with cheese, red onions, tomatoes and sliced beetroot and are served in a toasted roll for a burger extravaganza! Combine the minced beef and diced/grated beetroot together and mix thoroughly with your hands until the mixture has come together. Add the back pepper to taste. Divide the mixture into four equal balls, each about 100g in weight. Shape them into an oval and pat them into an elongated burger-shaped. Place them in the fridge to chill for 30 minutes before cooking. Cook the burgers on a barbecue or in a heavy based frying pan for four to five minutes on either side. A minute before serving, place a slice of Cheddar cheese on the tops of the burgers and allow the cheese to melt. While the cheese is melting, toast the rolls, and then carefully split them open. Put some salad leaves in to the toasted rolls and then place the cooked beetroot cheeseburger on top of the leaves, before adding the red onion rings, sliced tomato and finally a beetroot slice. Salt to taste at the table and serve with a side salad and chutney or relish.